In mid-August, when my Mum was taking a photography course, I got to go with her and Dad. We stayed at the Summit Lodge & Spa. Originally, Mum was going to make the trip alone, but then decided Dad needed a getaway too. She was really happy to discover the Summit was listed as dog friendly and I could join them at no extra charge. You can learn more about their pet policies and perks here. When we checked in, there was a dog shaped chalk board at the front desk, listing all the names of the dogs in residence. There were about 25 dogs listed! WOW! Mum just had to fill out a short form with my name and her contact info and we were good to go. 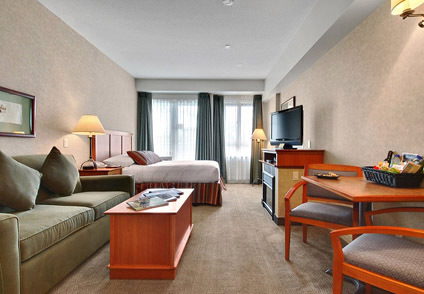 They gave us a room on the 2nd floor. Our room was very comfortable with a kitchenette, sofa, fireplace (which we didn't use because it was summer!) and a private balcony. There was lots of room for me to stretch out. My Mum and Dad brought my bed from home and my food dishes, but if they'd wanted to, they could have arranged to have the lodge provide these things for a small fee. I really liked the balcony. As long as I was good and didn't bark, Mum let me hang out out there, watching the world go by. It was Crankworx weekend while we were up there, so I did alot of people watching. When I had to go out, there was a really nice green space right behind the lodge. Throughout Whistler there are lots of dog bag stations and garbage cans, making it easy for dog owners to leave no trace and be eco-friendly. Whistler is after all, so beautiful and we want to help keep it that way! Our room was really quiet, but we did hear one naughty dog barking in the hall in the middle of the night. Luckily that didn't last very long and everyone went back to sleep. The staff were really thoughtful. I left a pile of cookie crumbs on the carpet and the cleaning staff came in while were were out and tidied it right up for us. The front desk staff gave me cookies too! Everyone was helpful and smiling and made me feel right at home. I'm giving Summit Lodge & Spa a big paws up for it's dog-friendly accommodation. 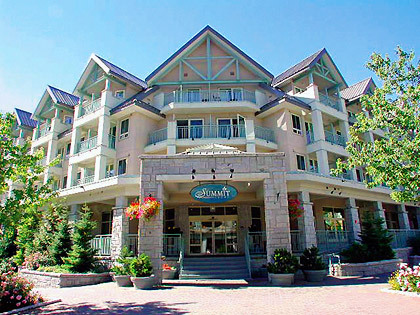 Mum and Dad say that we'll be staying there again, the next time we take a trip to Whistler. Hooray! All content of this blog is copyright Lelainia Lloyd/Indiana Jones 2012-2014 and may not be used in any way without permission. Please keep your karma good by respecting this. Woof! Content of this blog is copyright Lelainia Lloyd 2012. Powered by Blogger.